Fun Holiday Benefits with Larry and Jenny Keel! All year long, Larry and Jenny Keel & friends support lots of great causes including the cause AGAINST mountaintop removal with Appalachian Voices; pick up an “I Love Mountains” sticker at one of their shows! Last weekend, on Nov 27th, Larry and his brother Gary Keel played the Annual Toys for Tots Party to benefit the Rappahannock Council on Domestic Violence. The Keels are involved in two other music-filled benefits for the holiday season as well -see below for press release details- please join them if you’re in the areas! This year’s Christmas Jam will feature music by The Work, with performances by a veritable treasure trove of guest musicians. And this is part of the allure of the event, the ever changing line-up of musicians. 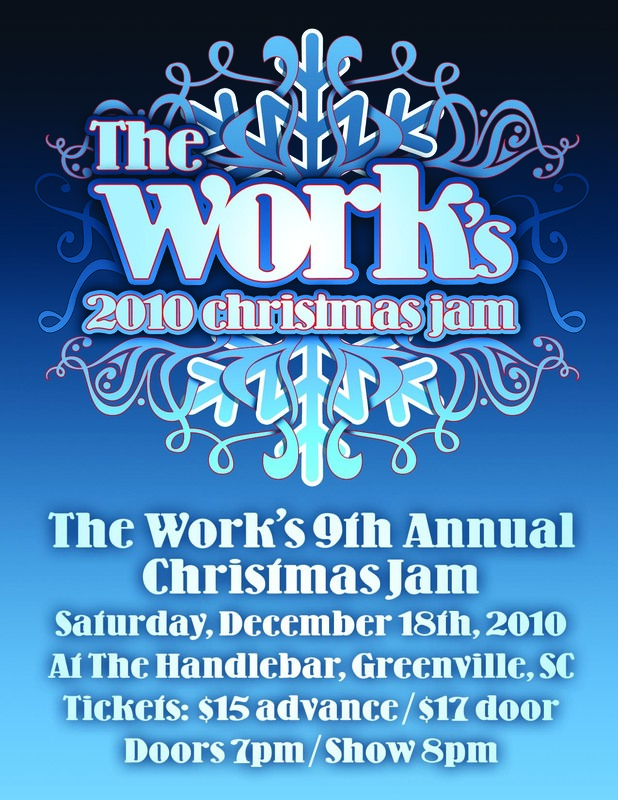 According to Craig Sorrells, “every Christmas Jam brings great memories for me with the completely unusual arrangement of musicians that come and perform with us.” The band is very excited about this year’s line- up as it includes such world renowned musicians as: Larry & Jenny Keel, Curtis Burch (New Grass Revival), Tom Gray (Delta Moon), and many more to be announced. Also joining this year will be several regional & local musicians including, but not limited to the Shane Pruitt Band, Doug Jones (Cravin’ Melon), Jonathan Lloyd, Jeff Holland, Violet & The Beauredarde’s, Tez Sherrard, plus many others. As well, there will be special surprise guest musicians making appearances during Christmas Jam. In its previous 8 years of operation, The Work’s Christmas Jam has raised $40,000 for local charities. 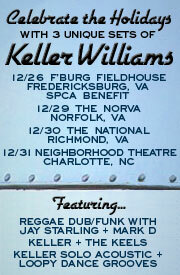 Before the NYE run kicks-off, Keller Williams brings his three-set extravaganza to his hometown of Fredericksburg, VA for his annual holiday concert to benefit the SPCA. To celebrate the ten year anniversary of the event, which will take place on December 26 at the Fredericksburg Field House, Keller has invited local marching band Elby Brass to join the show for set break music. 100% of the concert’s profits will go to support The Fredericksburg Regional SPCA. Less than 3% of The Fredericksburg Regional SPCA’s budget is received from the City of Fredericksburg, forcing the branch to rely almost solely on individual and corporate donations and fundraising events like this. The Fredericksburg Regional SPCA is a “no-kill” shelter whose mission is to tackle the problem of pet overpopulation through education, adoption, rehabilitation and spay/neuter. Set II will feature the bluegrass stylings of Larry Keel on guitar and his wife Jenny on bass with Keller playing his mini twelve-string (wanna-be mandolin) guitar. And Set III will be old school Keller on acoustic guitar with his trademark looped-out dance grooves. Big screen video visuals will be provided by Scott Sunn. Find out more about Keller’s holiday tour here. SHOW CANCELLATION: Vince Herman’s mother and father are both gravely ill and he will be unable to perform the SouthEast run of shows with The Herman Clan. Please keep Vince, Colin, Silas and their family in your prayers this holiday season. Bobby Miller and the Virginia DareDevils will be performing in their honor for the MoDaddy’s show this Thursday Dec. 2nd in Asheville. The creation of innovative and original music is an ever elusive goal in this day and age. The Virginia DareDevils’ primary mission to do just that is certainly well under way. From its humble beginnings three years ago in the acoustic music hotbed of Asheville, NC, this group of seasoned musical veterans has banded together to create an organic musical stew rooted in traditional melody and tone, layered with improvisational solos, and textured rhythms reminiscent of 40’s Bluegrass and 80’s Newgrass. With a tip of the hat, as well, to Swing, Old Time, and Psychedelic Rock and Roll, the result is a musical garment unique in style and taste. Members include Bobby Miller (Mandolin, Lead Vocals), Griff Martin (Guitar, Vocals), Jason Flournoy (Banjo), Rick Cooper (Upright Bass), and Tim Gardner (Fiddle). Find out more about the Virginia DareDevils’ new release, Brother Adieu, on the Asheville Roots Music Review blog. Lingua Musica Live Music Talk Show Tuesday, Nov 30th! Tune in or come on out! Join Lingua Musica LIVE at The Showroom in Spartanburg at 8pm Tuesday, November 30th! Joe Kendrick will be talking with Paul Riddle, Joe Bennett, David Lee and Jason Perlmutter about the history of music in the Upstate, Piedmont and its impact on the world up to the present day. The conversation will also cover the topic of about out of print and rare vinyl, as well as LPs in the context of analog recording and instruments. Spartanburg’s own The Antibodies perform songs in between the topics of conversation with The Pulse dancers as well as a set after Lingua Musica concludes at 9pm. 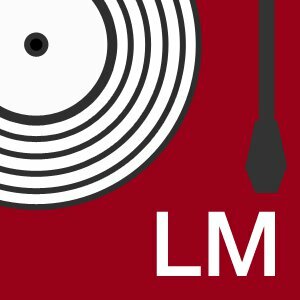 Lingua Musica streams live to the internet and takes live audience comments as well as through online viewers via the website and twitter. “The Antibodies show is like none other that you’ve seen before with music, dance and visuals — think ‘Pulp Fiction’ meets James Bond,” Showroom Director Stephen Long said in an email to the Herald Journal. The Antibodies consists of vocalist Tom Conder, Kevin Jameson on bass, Lee Holroyd on drums and Mark Branyon on guitar. Their influences are diverse, from The Clash to Ravi Shankar to Hank Williams Sr. In 2002, while a student at the University of North Carolina at Chapel Hill, Jason Perlmutter began collecting local soul recordings from North and South Carolina. On campus, he also served as a disc jockey and station manager at WXYC-FM, the university’s student-run radio station. In 2005, Perlmutter founded the Carolina Soul website, which serves as a living encyclopedia dedicated to the celebration and rediscovery of soul music from the Carolinas. Later he researched and compiled the 2007/2008 Jazzman/Now-Again “Carolina Funk” release, worked on the North Carolina Arts Council African-American Music Trails project, and co-founded the Paradise of Bachelors reissue record label. Over the years he has also disc jockeyed soul music at spots throughout the Carolinas as well as in Virginia, Washington, DC, and New York City. Drummer Paul Riddle was with the Marshall Tucker Band from 1973 – 1983. He was heavily influenced by Buddy Rich and his jazz styling were unique to a rock and roll band and heavily contributed to their unique style of music. He still lives in Spartanburg where he owns a drum stick company, The Carolina Stick Company, and teaches lessons. He occasionally sits in with the Allman Brothers Band and plays in a local band called Throbber. Lingua Musica springs from Joe Kendrick‘s love of music and the spoken word, and is the culmination of his work as a radio host and business owner along with his love of journalism and music, its culture and history. Not quite traditional, not quite modern. The Herman Clan plays MoDaddy’s in Asheville 12/2! SHOW CANCELLATION: Vince Herman’s mother and father are both gravely ill and he will be unable to perform. Please keep Vince, Colin, Silas and their family in your prayers this holiday season. Bobby Miller and the Virginia DareDevils will be performing in their honor for the MoDaddy’s show this Thursday Dec. 2nd in Asheville. The Herman Clan is proud to announce their debut East Coast Tour! Hailing from the music infused—and snow clad—mountains of Colorado, they bring with them a flavor of life and Bluegrass in Nederland, CO. 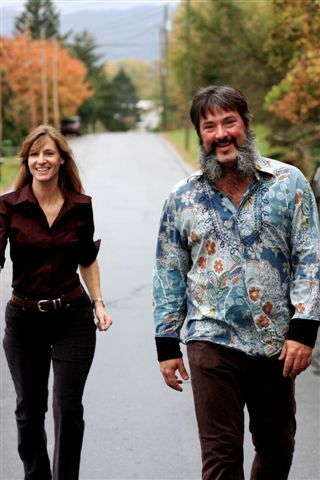 The Herman Clan is a family band led by the one and only Vince Herman of Leftover Salmon & Great American Taxi. Teaming up with his sons Silas and Colin on guitar and upright bass, respectively, The Herman Clan delivers their own unique and tightly knit interpretation of traditional bluegrass, Americana and beyond. Joining the Herman Clan for this run are: on Banjo Jason Flournoy, on B3 Hammond ~ Dave McCracken (Donna the Buffalo), on Mandolin ~ Bobby Miller (Virginia DareDevils), and on Fiddle ~ Zebulon Bowles (Emmit Nershi Band)! Larry Keel and Natural Bridge’s Alabama Getaway this weekend! Larry Keel and Natural Bridge are heading out for an Alabama Getaway this weekend! The first stop is tonight at 4:30pm CST/ 5:30 EST into Wildman Steve’s Radio Station! They’ll be doing a live session; you can tune in at www.wildmansteve.com. Tonight’s show (Fri 11/19) is at the print shop/ venue The Standard Deluxe in Waverly, Alabama with the Bibb City Ramblers! You can find out more in the Corner News and on Facebook. Then, on Saturday, they move on to the Workplay Theater in Birmingham and head on to play Callahan’s in Mobile on Sunday! As far as flat-pickin’ guitar goes, Larry Keel is second to none. The bearded guitar legend has been wowing audiences since a young age and has the credentials to prove it.Born and raised in Southern Virginia, Keel was reared on some of the oldest music that America had to offer. When his Dad and brother began giving him guitar lessons before he was 10 he immediately took to the instrument and the rest is history. Keel’s recent collaboration with Natural Bridge has spawned two albums of original, high-spirited bluegrass. The group is currently touring in support of their most recent album, “Backwoods,” a collection of tunes that take traditional mountain bluegrass jams and turns them on their head. Here’s a video to get you ready for this flatpickin’ weekend! The truth behind the name of Donna the Buffalo: It actually was not a slurred MC… and it was never actually the name of the band. They had a session trying to figure out the name of the band and a musician friend, kind of as a joke, suggested, “Dawn of the Buffalo”. The band at the time including Tara and Jeb all herd “Donna the Buffalo” and reacted positively to that. They knew they wanted “buffalo” in the name and they’re not sure why they liked it, they just did and from the first show on they have been known as “Donna The Buffalo”. To hear the REAL story of how DtB got their name listen in to this podcast interview with Jeremiah Greer, DtB interview starts at the top of the 2nd hr. 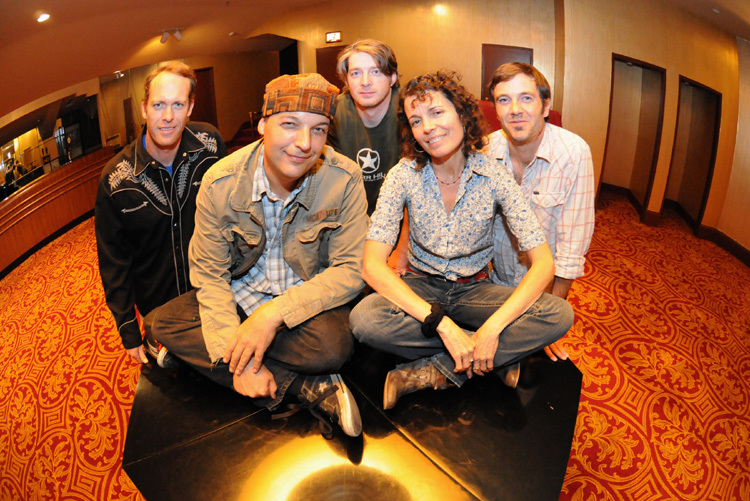 Donna the Buffalo plays the Tralf & the Oneonta Theatre this weekend! Donna the Buffalo has a great weekend in store! This Friday, Nov 19th they play the Tralf in Buffalo and then on Saturday they head over to the Oneonta Theatre on Saturday 11/20 for a show with Sim Redmond Band! Originating in Trumansburg, NY in 1989, Donna the Buffalo rove the Midwest and Eastern seaboard as one of the few touring roots bands. The Herd, their self-proclaimed fan base, loyally trails the band as they market their rather eclectic styling. Eclectic may be an understatement for this ensemble, as their sound is a hybrid of mountain music pervaded with Cajun/zydeco, folk-rock, country-rock, Reggae, and bluegrass. Donna the Buffalo is true to their home-grown roots, however, they incorporate a modern zest. Their barefoot-in-the-grass, feel good, poetic music filters through the heart and soul and thus expands the mind. Nevins and Puryear’s vocal capabilities are true to the folk art genre, painting a beautiful, spiritual image in the mind. Their musicality and brilliant use of both traditional and nontraditional instrumentation brings to life the roots of music with the roots of mankind and nature. It has the warmth of that freedom of driving down an open country road, wind blowing through your hair and fingers, sun gracing your face, fresh air filling your lungs and the sight of nature untainted. Thus it is much like the phenomenon of ‘loud silence’. They stay true to themselves, while they continue to evolve in their art. Their music defines the idea that past meets present, and in turn, contributes to the future with spiritual, deep thought entertainment. They provide amusement that manages to bring attention to and engage all your senses in response to their meaningful reflections to life and love. and here is another one posted in Art Voice.